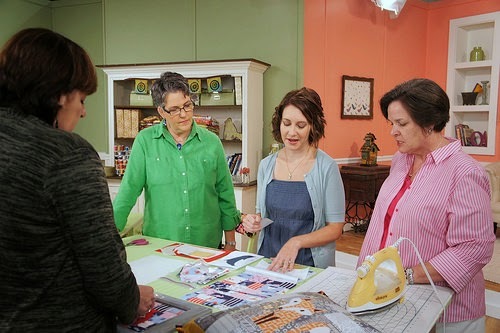 Lily's Quilts: Want to learn curved piecing? Want to learn curved piecing? 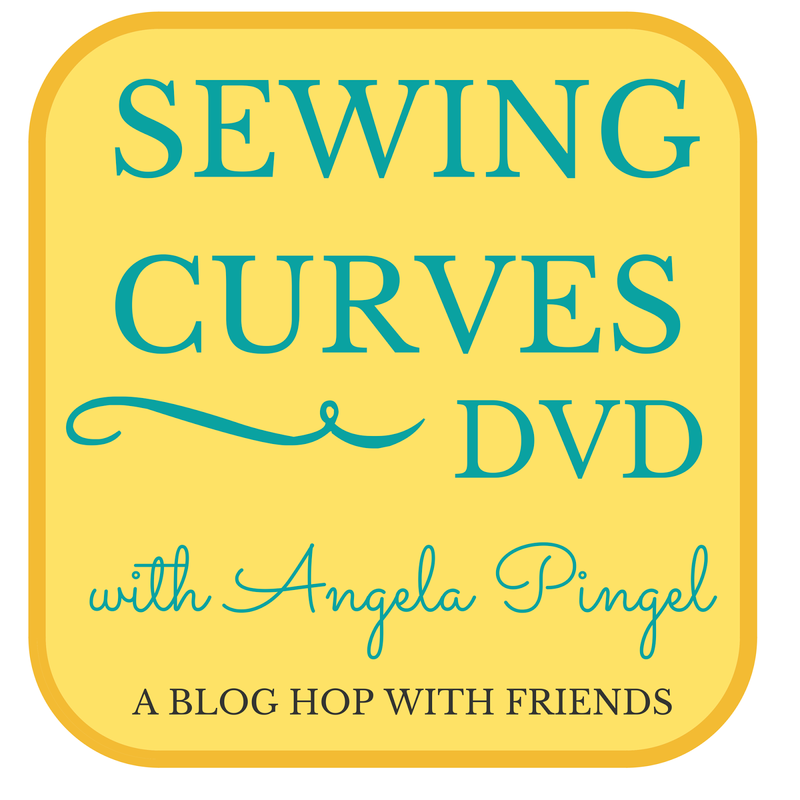 So today I am stop one on the blog hop for Angela Pingel's brand new DVD, published by Interweave, snappily entitled Sewing Techniques for Accurate Curved Piecing: Basics and Beyond and you will have a chance to win a copy of the DVD at the end of the post. The tour kicks off here and on Angela's blog today and then continues to the following blogs listed below. At each stop on the tour you will have a chance to win a copy of the book although only if you are in the US (sorry ROW!). Since it's hard to take good screenshots from a DVD I've borrowed a couple of Angela's photos from the filming of the DVD for this post. I sat and watched the DVD while sewing yesterday and I have to recommend it to anyone who would like to master curved piecing of any type, whether it be traditional drunkard's paths blocks, improv curved piecing or piecing ovals and other curved shapes. The great advantage of learning something on a DVD is that you can literally see how the curves are cut and pieced in a clear way as you actually see Angela sitting down at her machine and sewing them and then pressing them. So the fear is taken right out of the curved seams. 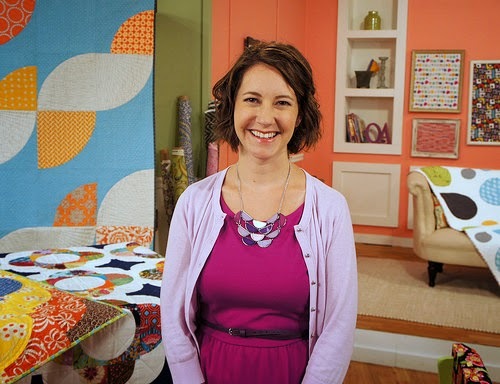 Angela showcases a whole variety of different blocks, projects and designs in the DVD including some which appeared in her book, A Quilters Mixology, and many more. The DVD would be perfect for anyone looking to learn how to sew curves or gain confidence in sewing curved seams and also for anyone looking for new inspiration for their curved seam projects. To be in with a chance of winning a copy, leave a comment on this post (US only) and I will draw a winner a week from today. Curved piecing is on my bucket list of things to learn. This would be a great tool to help. LOVED the book! The DVD would be a great reference as well! 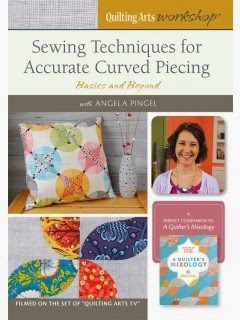 I have Angela's book, and am hoping to gain the confidence in curved piecing. A DVD would be an great addition to increase my skills! Thanks so much for the opportunity! Would love to improve my curve sewing skills! 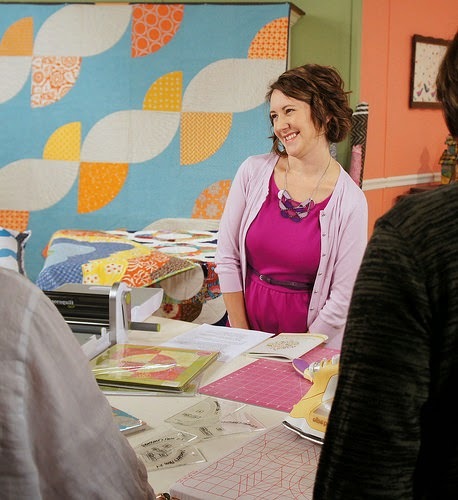 I want to make an improv-pieced DWR quilt, so this would be a great help! I could use some curved piecing tips. I've a project that stopped at the point of a whole bunch of curves--drunkard's path. Mine were looking more like drunken quilter. 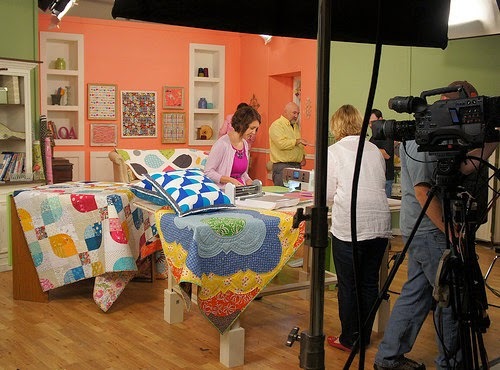 Looks like a must-have DVD ~ I've never even tried curved piecing before, so I know this would help! Thanks for the chance ~ fingers crossed!! The DVDS sounds like just the ticket for me...fear of curves...thanks for the chance! I can't tell you how many times I have tried curves (so many it's embarrassing). I could only hope this dvd could help?! It would be wonderful to learn the secrets of great curves. I have her book do the DVD would be great to have! Curved piecing is one of the areas I need to improve on. The dvd would be most wonderful! Think I'm going to have to get the book too. I would love to learn to do this better. Thanks so much for the chance! I would love this book. Thanks for the opportunity. I'd "sew" love to win this! I have the book but feel like I need the DVD!!! Thanks for the chance to win! I love your creativity and I love Angela's! This DVD looks so amazing and most certainly something I am hoping to obtain to help concur my own fears with curved piecing. I am excited to begin but continue to feel "stumped". I have Angela's book and know the DVD would be a great compliment. Visual learning is such a help! This looks like a good video as curves are a mystery to me and I have so little experience with them. Angela, you look good in these stills...cannot wait to see the whole video. I would love to learn the proper way to sew curves instead of just winging it like I do. I'll probably learn that I was doing it all wrong. Thanks for a great giveaway! 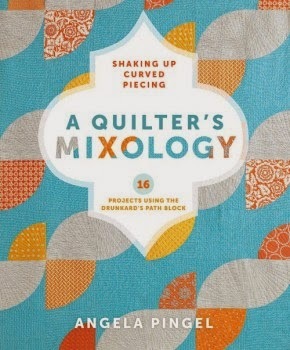 I received A Quilter's Mixology for Christmas and would love, love the DVD to help me learn to properly piece curves! Curved piecing and sewing them flat almost scares me, but I really want to learn and conquer this fear. I am such a visual learner, so a DVD would be the perfect fit for me! I could use some instruction on curved piecing. Thanks for the giveaway. b.j.day68@gmail.com. It's been awhile but I'm up for the challenge. I'd love to see this book. I would like to improve my curved piecing! Thanks for the giveaway. Thanks for the opportunity. Seeing it in action is so much better for me! I have been wanting to make a couple of quilts with curved piecing. I would love to win! Thanks for the chance! Never tried curves before- would love to learn how! I've had my eye on Angela's book, so this video would be a great accompaniment. I've started the Arabian Nights quilt after getting Angela's book but would love some tips on curved piecing other than pins, pins, pins from dressmaker techniques. There's got to be a better way! Thanks. That looks so great! I'd love to have a copy. Thanks! I have never made a pieced curved block before, I always switch it to an applique version. This video looks like an amazing way to learn. Thanks! I would love to improve my curved piecing! Thank you for the opportunity! This book looks great learning how to sew curves. Curves are definitely on the list of things I need to learn how to do. I love her book, but could definitely use some help with execution! Thanks for the review. I really need help with sewing curves. Excited to try curves just scared!!! Sewing curves does look like fun. I would LOVE to learn to sew curves without intimidation!!!! I love Angela's book would sooooo enjoy having the companion video to help me tackle these curves! Making a video as a companion to the book is a great idea. I think a lot of sewists are intimidated by curves, and being able to watch someone pin, then sew, then press the fabric, step by step, would be so helpful. Would love to learn curved piecing. Thanks for chance to win! Would love this DVD, curves are my goal for this year! I have only tried curves a couple times and am by no means confident, but I'd love to try a clamshell quilt. This book looks great! Curves! I have such a hard time with them! My very first quilt that I am working on is a Dear Jane. There are lots of squares in the quilt that have curves. I love the challenge, but would love to improve my skill! I would love to improve my curve sewing....looks like the DVD is the ticket to my success! I need this! A drunkards path has been on my bucket list for way too long! Thanks for the chance to take it off my list! I'd love how to learn to machine curves as I'm finding hand sewing them painfully slow! Curves are my nemesis. And some of the quilt patterns I'd love to sew have them. This DVD would be of great help. This sounds like an excellent resource. I'm librarian for our local Modern Guild and would love to add it to our library. Thanks for the chance. I would love to be able to do curves, confidently and competently!! Thank you for the opportunity to win!! I love watching instructional dvds! I love sewing curves and watching instructional videos. Pick me. I have always been intimidated by curved piecing and would love to feel more confident in it! Your review of the DVD makes it sound like it would be a great help in sewing curved pieces. Thanks for all the pictures too. This sounds like a fantastic resource. Thanks for the giveaway.